Be the first to share your favorite memory, photo or story of Lorena. This memorial page is dedicated for family, friends and future generations to celebrate the life of their loved one. 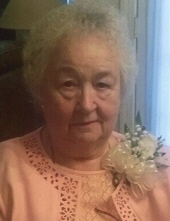 Lorena Vandiford Bunn, 79, passed away early Tuesday morning at Kitty Askins Hospice Center surrounded by her family. Lorena was born in Greene County on January 25, 1940 to the late Herbert Marshall Vandiford and Virginia Belle May Vandiford. She was married for over 54 years to the late Kermit Melvin Bunn. Lorena was a member of The First Pentecostal Holiness Church and was involved in many church activities where she utilized her gifts and abilities to share the love of God. She will be remembered by her family as a loving wife, mother, grandmother, great-grandmother and great-great-grandmother. The family will receive friends on Saturday, April 6, 2019 from 1:00 – 2:00 p.m. at Seymour Funeral Home followed by a service to celebrate Lorena’s life at 2:00 p.m. in the chapel with Rev. Bill Rose officiating. Entombment will be in Wayne Memorial Park. Lorena is survived by her daughter, Melvin Cecelia McMillan and husband Roy of Snow Hill; sons, Ronnie Dean Bunn and wife Linda of Goldsboro and Herbert Elias Bunn and wife Alice of Goldsboro; grandchildren, Shauna McMillan Jones (Michael), John McMillan, Walter Scott Bunn, Thomas Bunn, Scott Seymour and Kevin Seymour; five great-grandchildren and one great-great-grandchild. She is also survived by her brothers, Richard Vandiford and Charlie Vandiford and sisters, Hilda Faye Smith and Virginia Shafer. In addition to her husband and parents, she was preceded in death by her grandson, Andy Jay Bunn. In lieu of flowers, the family suggests memorials be given to the Ronald McDonald House, 529 Moye Blvd., Greenville, NC 27834 or to Kitty Askins Hospice Center, 107 Handley Park Court, Goldsboro, NC 27534. To send flowers or a remembrance gift to the family of Lorena Vandiford Bunn, please visit our Tribute Store. "Email Address" would like to share the life celebration of Lorena Vandiford Bunn. Click on the "link" to go to share a favorite memory or leave a condolence message for the family.